Meet Kenneth Hughes, Jr. – Write with us! 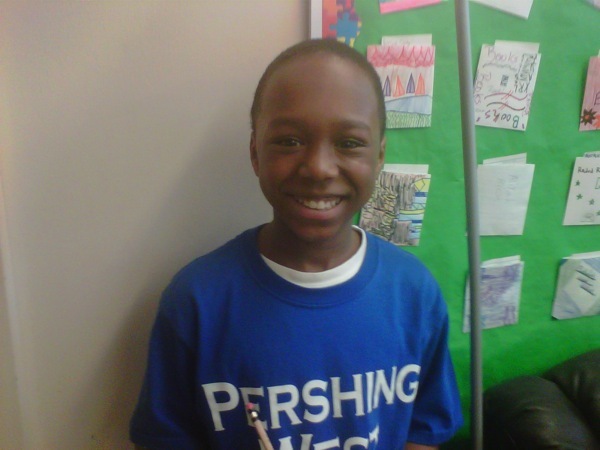 He’s Kenneth Hughes, Jr., a 5th grader at John J. Pershing West Middle School in Chicago, IL. In a program sponsored by TT Patton, Kenneth’s essay was selected from over 30 entries submitted from his school. Therefore, he and his dad will travel with TT Patton to Washington, DC for the Pens & The Post: Collect, Correspond, & Celebrate on May 29th, co-hosted by Pen Collectors of America (PCA) and held at the Smithsonian National Postal Museum. Kenneth has a passion for writing and as you can see from this photo seems to be very excited about winning the trip. Here’s just a bit of his moving essay as he responds to why the art of writing is important to him and his generation. Kenneth and Augustine Benjamin, the winning student from Roslyn Road Elementary School in Barrington, IL, will be honored in a private reception Friday evening May 28th before the exhibit opens. One of the presenters happens to be, Geoffrey Parker, a descendant of Parker Pens. Yep! I can’t wait to see how big Kenneth’s smile will become. For those of you that participated in the fundraiser at TT Patton, thank you for supporting Pens for Kids. It’s a way to keep the art of writing alive in an age of growing technology. Click here if you are interested in attending the Pens & The Post: Collect, Correspond, & Celebrate or just to learn more. There’s still time to get your tickets to DC! Love the visual on this post! Handwriting sure does pop out on the computer screen, doesn’t it? Such sweet sentiments.